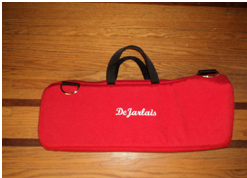 Custom-made gig bags for trumpet, cornet, flugel, and piccolo trumpet. Carry everything to any gig in one handmade bag designed for you. Is the bag for your horn the right size? Can it carry the Bb & the flugel you need at the musical 5 nights a week? What about carrying the things you never have room for, like that extra mute that never seems to fit? 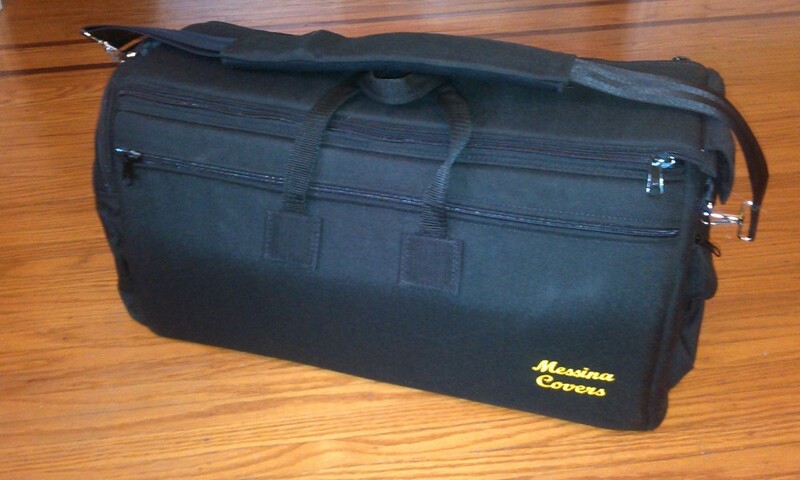 At Messina Covers we have a passion and the expertise needed to create bags that meet the needs of the most demanding trumpet players. We have been tweaking our designs for the past 15 years in search of creating the perfect trumpet gig bag. 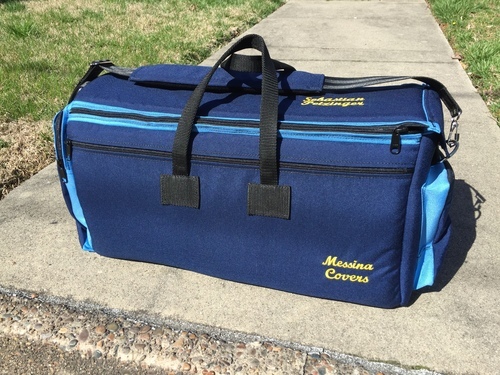 All of our trumpet bags are available in any of our colors and with custom embroidery. Have a question that isn't answered below? Just contact us! Standard 2.5: Holds 1 Bb trumpet, piccolo, and a flugelhorn. The piccolo sits in a wedge on top of the Bb trumpet. The bag has one zippered side pocket for music and another non-zippered music pocket. It has a large end pocket that will hold 4 mutes and a small end pocket that holds pencils, mouthpieces, tuners, and valve oils. Airline 2.5: Fits within airline carry-on regulations. 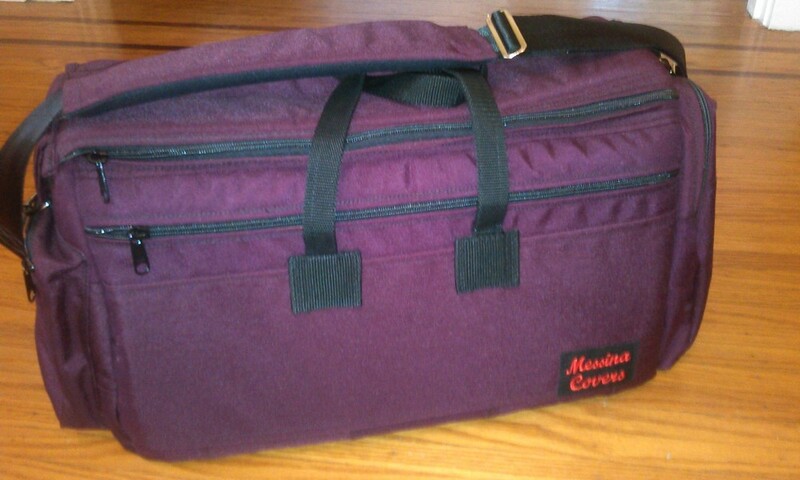 Holds 2 Bb trumpets and a piccolo OR compact Eb trumpet OR 1 trumpet and a flugelhorn (ask about our flugelhorn divider.) Has two small end pockets that holds pencils, mouthpieces, tuners, and valve oils. Has large zippered music pocket on bottom. Very popular bag with backpack straps. Standard Triple/3.5: Holds 2 Bb trumpets and a flugelhorn. Buy the picc wedge and you can carry 3.5 horns! Has one zippered side pocket for music and another non-zippered music pocket. Has a large end pocket that will hold 4 mutes and a small end pocket that holds pencils, mouthpieces, tuners, and valve oils. Quad: Holds up to 4 Bbs. Most players carry a Bb, C, Eb, and picc in the quad bags. Vince and Gabriel DiMartino carry our quad bags. Has one zippered side pocket for music and another non-zippered music pocket. Has a large end pocket that will hold 4 mutes and a small end pocket that holds pencils, mouthpieces, tuners, and valve oils. Which Messina Cover is right for you? Why buy the standard triple? If you want to carry a Bb, a C, and a flugelhorn you will need the triple. If you like to carry a Bb, flugelhorn, and a laptop inside of your gig bag. Why buy the standard 2.5? Because it is smaller overall and therefore easier to navigate through doors. If you never carry Bb, C, and flugelhorn at the same time you will like the standard 2.5. If you need to carry 4 large horns (4 Bbs) you will need the quad.